Have you even found that your Android phone is running slower and slower and having less and less storage space after using your Android device for a long time? So in this case, what will you do to save more space on your Android phones? 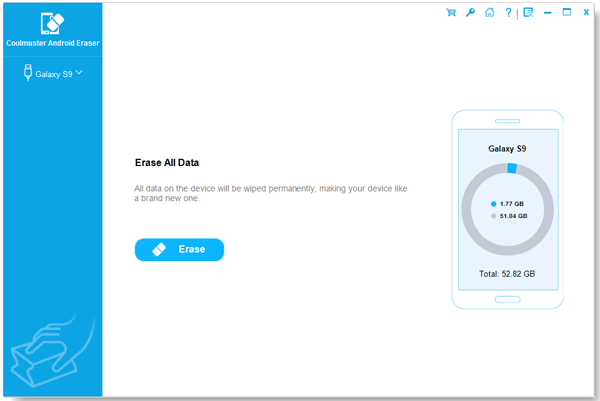 Simply delete files from your phone to free up more Android space? But what if these deleted files are of the same importance of those saved ones? Actually, you can free up Android space by cleaning up those junk files lurking in your phone but doing nothing at all. Every time when you download files to your device such as a picture, an app and etc, the corresponding junk files like app caches, temporary download files and many more will be generated and saved in your device, which won't disappear automatically. So, you can to rely on this Android Eraser to clean up the useless files from your phone so as to free up enough space on your Android device to save new files as wanted and needed! By the way, all Android brands and devices are fully supported by this software, including Samsung, LG, HTC, Sony, and many more. Now, you can download the free trial version of this software to try it out by yourself! After opening the installed software on the computer, you can get your Android phone connected to the computer via the USB cord. After that, choose the right mode to continue the process. Then you need to choose the files you want to clear from your phone by ticking them out. After that, click on Erase option to begin the file cleaning process in one click. Now, all the unwanted junk files will be removed from your Android device. And you will find you have saved more space on your Android phone, so you can now save other new files as wanted!